According to figures issued by the Department for Transport, every train firm except one was helped out by the taxpayer. 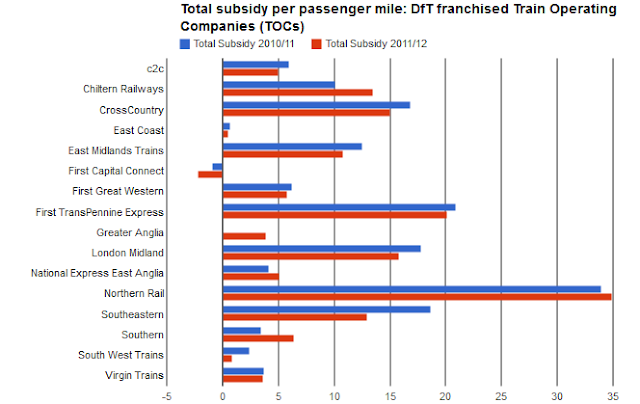 Just one train operating company wasn't subsidised overall last year, according to the latest figures from the Department for Transport, and that was First Capital Connect, which runs trains from London, Brighton, Bedford, Peterborough, Cambridge and King's Lynn. At the other end of the scale, Northern Rail got nearly 35p back for every passenger mile travelled on their trains (this figures does not include Scotrail and Arriva Trains Wales that are subsidised separately by the Scottish Parliament and Welsh Assembly). Figures published by the Office of Rail Regulation based on passenger kilometres, converted to miles. This is calculated by taking the total Network Grant, apportioned according to each franchise’s share of Fixed Track Access Charges. 1. Negative figures reflect where train operators were paying a premium to DfT rather than receiving a subsidy. 2. The National Express East Anglia franchise ended on 5 February 2012 when Greater Anglia took over the franchise. This money is in addition to the fare paid by the passenger.